This article written by Boris Prilutsky LMT, MA has a very interesting history. Currently Boris works with a group of scientists who examine the impact of Medical Massage on patients after post-concussion and with post-traumatic encephalopathy. At the same time Boris hosted a professional blog in an on-line edition of Massage Magazine. One day he decided to share with therapists some concepts of this therapy and preliminary clinical data obtained so far. To his and our surprise several therapists who belong to the massage bureaucracy sent letters to the Editor of Massage Magazine demanding that this information be deleted since according to them it is out of the scope of the profession. We in JMS regularly witness incredible reluctance from the side of the American massage bureaucracy to embrace or at least keep an open mind to Medical Massage. Some even support people who spread completely false fears that the clinical aspects of massage therapy are out of the scope of massage practice. While physicians currently examine and treasure Boris’ expertise in post-concussion treatment with Medical Massage, Massage Magazine gave in to the pressure and ended this important discussion. We would like readers to judge for themselves if the information Boris shared with therapists is in our scope of massage practice. Here is the first part of his article. American football is a huge part of American life. It is impossible to imagine our country without the Super Bowl. However, football has also a very dark side associated with death and irreversible changes in the brain function of players. Let’s look at the life of an average football player. From a relatively young age he undergoes body and head collisions of different intensity. One of the most dangerous consequences occurs during high school and college years when the brain is still going through the final stages of development and at the same time is actively loaded with information. During these years young athletes frequently experience so called Repetitive Head Injury Syndrome (RHIS). In these cases the young athlete continues to compete after what initially seems like relatively mild head trauma. While doing so he encounters repetitive mild concussions which add up to and create a slowly lingering clinical picture of RHIS. “The effect of multiple concussions over time remains significant and can result in long-term neurologic and functional deficits. These multiple brain insults are termed Repetitive Head Injury Syndrome” (Cifu, et al., 2014). While the professional football player continues his career, the intensity and violence of his head injuries increases. Let me give you one stunning example. Scientists from Boston University examined 79 brains of deceased NFL players from Brain Bank and found that 76 (!) had exhibited changes associated with Chronic Traumatic Encephalopathy (Breslow, 2014). These brains were donated by relatives or arranged to be donated by players before they died. Boxing and Ultimate Fighting are even more gravely dangerous to athletes while less alarming but still hazardous situations happen in ice hockey, soccer and other contact sports. Finally, we are forever in debt to our veterans who come back home after being severely injured by improvised explosive devices (IEDs) in Afghanistan and Iraq. It was reported that 20% (!) or 233,000 service members who served in Iraq and Afghanistan suffer from Traumatic Brain Injury (Meyer et al, 2010). For further discussion, the understanding of the mechanism of concussions and its impact on the human brain need to be clarified. When we are running, jumping or even walking, neuronal and axonal membranes are stretched within the normal physiological range. 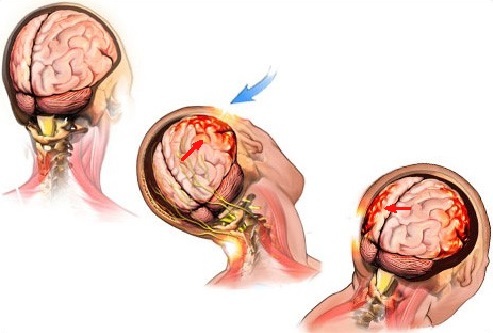 A significant blow to the head can produce sudden sprain of neuronal and axonal membranes and a bouncing impact of the brain against the skull. Fig.1 illustrates the mechanism of concussion when opposite sides of the brain are traumatized after one direct blow on the left temple. The stress of brain membranes and micro bleedings into the brain tissue triggers release of different neurotransmitters, especially glutamine, and substances called cytokines which accompany any type of inflammation in our body. The next step is post-traumatic cellular derangement and an increase in cerebral spinal fluid (CSF) secretion. The first outcome of these events is the increase of intracranial pressure, which compromises cerebral circulation. As it was shown by Yamakami and McIntosh (1989), cerebral circulation can be reduced by up to 50% of normal. In approximately 2 to 4 weeks after concussion the brain metabolism slows dramatically because of the negative impact of local inflammation in combination with lack of proper oxygenation (Bergsneider and Hovda, 2000). At this point ATP or fuel production greatly diminishes by mitochondria. As soon as the normal amount of ATP diminishes, it becomes the first step to the irreversible changes in neural connectivity, especially if the individual continues to suffer repetitive concussions disintegration. If the patient has experienced repetitive mild concussions, he or she starts to develop Post-Concussion Encephalopathy (movement disorders, memory loss, psychiatric behavioral disorders, chronic headaches etc.). One of the major mechanisms of these profound changes in the function of the brain is alternation in the function of so-called tau-protein. 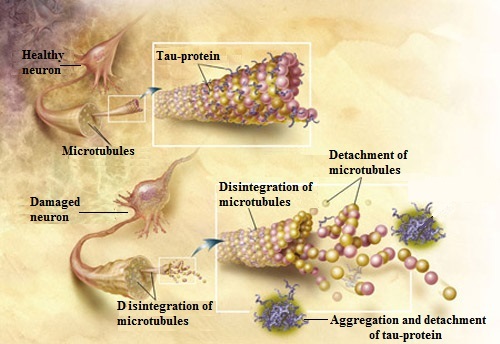 Tau-protein is an important part of normal brain function since it supports the function of neurons. This protein forms microtubules which support neurons with transport of necessary proteins, nutrients and ATP molecules along neuron and transport back waste products. Without that the neuron would deteriorate (Ballatorre et al, 2007). Fig. 2 illustrates tau-protein in normal and damaged neurons. As a result of concussion, especially RHIS, the normal microtubules deteriorate, tau protein accumulates excessive phosphorus and crumps together and eventually detaches from neurons. Then, these wondering tau proteins accumulate in the different parts of the brain tissue disrupting its normal electrical activity and causing all neurological symptoms associated with RHIS (Gerson et al., 2016). By the way, the same mechanism is responsible for the progression of Alzheimer’s disease. Separately I would like to address the Glymphatic System, which is very important for this article and for post-concussion patients. 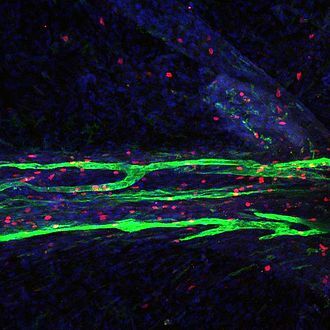 Since the presence of lymphatic vessels wasn’t detected in the brain, the exact mechanisms of waste removal from CNS until recently were a great puzzle for scientists. However, thanks to the works of brilliant Danish neuroscientist Dr. M. Nedergaard we know now how it works. Dr. Nedergaard named the brain’s main waste removal system the Glymphatic System. I will illustrate this complex issue with the help of the picture from Dr. Nedergaard’s original article (2013). The picture above illustrates a cross section of the brain’s circulatory system. The areas with light brown color indicate flow of CSF. On the top of the picture you see the skull with subarachnoidal space which contains CFS. While arteries, which bring blood, enter the brain they also pull along CSF which flows along the arteries in a so-called para-arterial influx route located in para-arterial space. 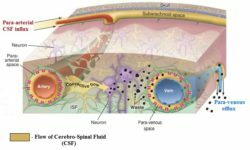 Under the pressure generated by arterial pulsation, CSF leaves para-arterial space and forms the connective flow which now goes through the brain tissue itself (i.e., brain parenchyma) and it cleans the waste produced by neurons. Eventually, the connective flow ends up around the neighboring veins in the para-venous spaces which allow the CSF, which now carries waste products, to be drained along the veins via so called para-venous efflux until CSF with all the waste it carries enters the lymphatic system outside of the brain in the head and neck areas. Thus the flow of CSF itself is a major waste removal mechanism the brain uses to allow neurons to function properly. “The restorative function of sleep may be a consequence of the enhanced removal of potentially neurotoxic waste products that accumulate in the awake central nervous system.” (Xie, et al., 2013). Finally, there is another recent breakthrough in the work of Louvain et al. (2015) who proved that the drainage to the lymphatic system doesn’t happen only outside of the CNS, but also inside the brain itself. These scientists for the first time detected the presence of the lymphatic vessels inside the brain and in such cases, besides indirect flow of waste products through the Glymphatic System, we now know that the brain can drain waste directly into the lymphatic system inside the CNS. Fig. 4 illustrates the lymphatic vessels inside the brain. The information about the Glymphatic System is critically important to massage therapists and to the protocol we will discuss in Part II of this article. It scientifically justifies the critical role Medical Massage plays in the treatment of post-concussion symptoms. There are a lot of pathological events in cases of RHIS which affect the function of the brain and the brain tries to coupe with them to the best of its ability. One of these mechanisms relative to the Medical Massage practitioner is called apoptosis (AP). AP or death of the cells is executed by the body itself in a programmed fashion. In other words, this protective mechanism allows some cells to die in order to avoid further massive damage. This programmed death is slow disintegration of the cell. After the cell gets a signal to deteriorate its inner skeleton (or cytoskeleton), it starts to disintegrate and cells develop areas of blebbing and condensation of the nucleus. 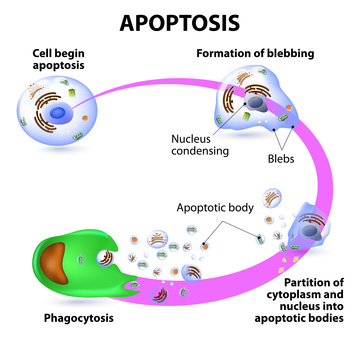 Finally the cells burst into pieces to form apoptotic bodies which are later cleaned by phagocytes during phagocytosis. Fig. 5 illustrated stages of AP. The only way to prevent AP and help neurons survive is to increase cerebral circulation and decrease pressure of CSF. As readers will see in the Part II of this article the information we discussed above has direct impact on what the massage therapist must or shouldn’t do while working on patients after concussion or post-traumatic encephalopathy. In the final part of the article we will go over the Medical Massage protocol which must be part of rehabilitation therapy. Ballatorre, C., Lee, V.M.Y., Trojanowski, J.Q, Tau-mediated neurodegeneration in Alzheimer’s disease and related disorders, Nature Reviews Neuroscience 2007 Vol 8 (9), Sept: 663-72. Gerson J, Castillo-Carranza DL, Sengupta U, Bodani R, Prough DS, DeWitt DS, Hawkins BE, Kayed R. Tau Oligomers Derived from Traumatic Brain Injury Cause Cognitive Impairment and Accelerate Onset of Pathology in Htau Mice. J Neurotrauma. 2016 Apr 22. Louvain, A., Smirnov, S., Keyes, T.J., Eccles, J.D., Rouhani, S.J, Peske, J.D., Derecki, N.C., Castle, D., Mandell, J.W., Lee, K.S., Harris, T.H., Kipnis, J. (2015). “Structural and functional features of central nervous system lymphatic vessels” ‘Nature’. Mckee AC, Daneshvar DH. The neuropathology of traumatic brain injury. Handb Clin Neurol. 2015;127:45-66. Nedergaard M. Neuroscience. Garbage truck of the brain. Science. 2013 Jun 28;340(6140):1529-30.